The month of December is a special time at the Folk School. 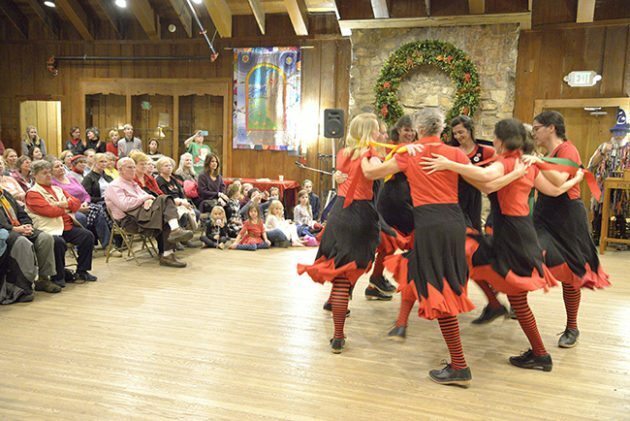 Events, parties, food, themed classes, concerts, dances and performances unite the community in the holiday spirit. When the wreaths, garlands, and handcrafted ornaments appear in early December, we know the magic of the season has arrived. 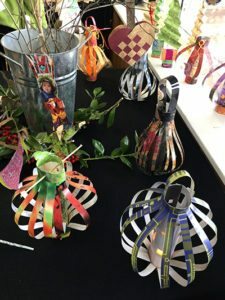 Recently, I connected with Nanette Davidson, our longtime decorating maven and mastermind, to ask about holiday traditions at the Folk School. Enjoy our interview! CP: When does the holiday season begin for you? ND: Well, I think about this off and on through out the year, planning simple projects for the winter holiday season and for spring’s May Day and June’s Auction Gala sometimes many months in advance. I have asked for help from other artists and dancers in the community to generate handmade decorations including giant puppets for parades. Jan and I love the seasonal celebrations that come from many rural, agricultural communities. When you live in the Appalachian countryside where there are distinct perennial landscapes, it’s easy to celebrate the beauty of the changing seasons. 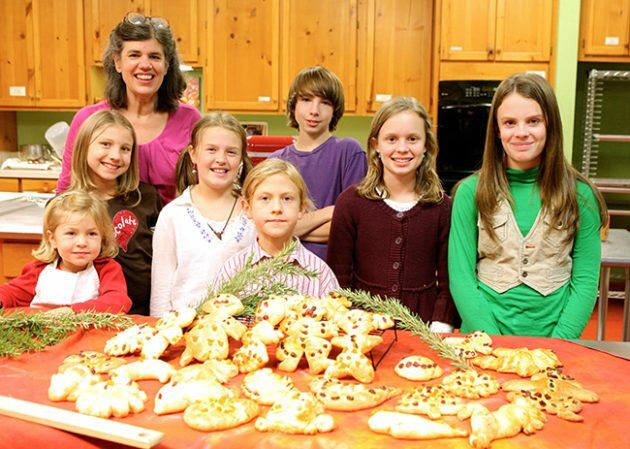 CP: What is your favorite Folk School December holiday tradition? ND: We have so many great parties in December for the local community as well as our students who come in for a week. In the original days of the JCCFS, the student body was closely tied to the community and seasonal events were held to pull everyone together. We still want to include our local community and they are present here at weekly dances and concerts. We have the Old Folks Party, Christmas Dance/Dessert Potluck, New Year’s Eve Dance, and the Children’s Party when Santa arrives in the BFD Firetruck, sirens wailing. 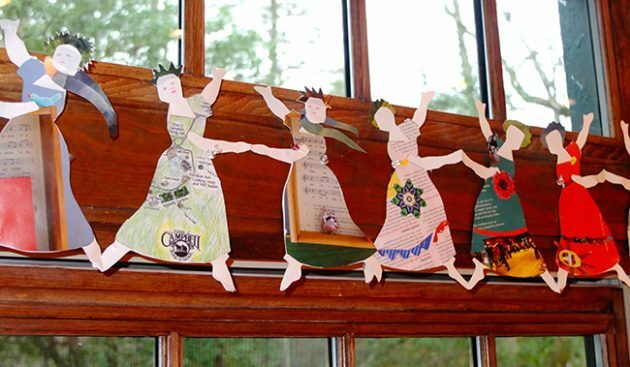 I have always helped with the Children’s Party which includes crafts, musical chairs, storytelling, Morris performance, homemade cookies, and live music and dance for the kids. Even though we are an adult school we reach out to our local kids at Christmas and in the summer. More and more show up on the dance floor now. Every child that has a great folk school experience can help us preserve the school for the future. Dame’s Rocket Clog Morris Dancers perform a dance at a holiday party. Our gorgeous large wreath hangs over the fireplace in the background. CP: Is there a philosophy or overall theme behind the holiday decorations at the Folk School? ND: The philosophy Jan and I have strived for is to keep it simple, real, and handmade. There are many reasons for this, especially the opportunity to use the abundant and beautiful natural greenery that grows on our campus and fills the house with sweet smells. It’s a nod to the past, present, and hope for the future. When our family moved back here in 1992 I was given the volunteer job of decorating the school at Christmas and I wanted to make it really lovely with basically no time or budget. 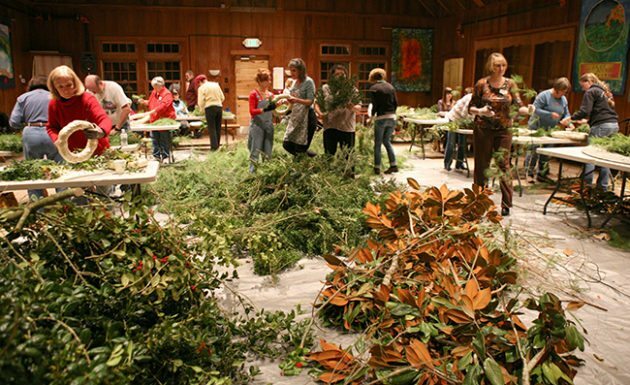 I taught myself how to make greenery wreaths and then led a free workshop for local folks and folk school staff. I gave them the skills to make the wreaths and they made a wreath to display at the Folk School. I have been doing this now for twenty five years. We have produced hundreds of gorgeous wreaths, garlands, and kissing balls with the help of a very solid crew of community dancers, friends, staff, and others. I couldn’t manage it without John Clarke and his crew who cut boxwood, magnolia, pine, cyprus, holly, and nandina by the pickup truck load. They also find a big Christmas tree for the Community Room and put it up. This year, locals Charles Watson and Sonya Crouch came to make the huge wreath that hangs on the Community Room fireplace. It takes hours! Wreaths made out of greenery and paper decorate the Keith House. Community members come together to create wreaths for the Folk School. CP: Reusing the Folk School catalog is a brilliant and resourceful way to make ornaments. How did this tradition get started? ND: About five years ago I got the idea to create some paper ornaments and decorations using recycled folk school catalog paper. Our catalog is so full of lovely photos and color pages, maps, and text. It’s printed on excellent paper. We don’t usually have many leftover from each printing after they expire so that makes them even more special. Keather Gougler, who designs the catalogs and is a painter and paper artist, wanted to work with me to design projects that we could also teach to community members who help us decorate. Two magazines have featured photographs of these works. This year we offered recycled paper ornament making as a class for students. It ran for the first time last week. We had a wonderful time making banners, flags, lanterns, angels, birds, chickens, tiny houses, lords-a-leaping and ladies dancing. This year, she and I made a flag banner for the stage in the Keith House out of catalog covers. Those covers are spectacular and showcase the work of artists and photographers who have participated at the school in some way. CP: Holidays can be a very overwhelming time for people, especially people who want to put in the time and effort to make the season special. Do you have any advice or ways you personally cope with the craziness of the season? ND: This is a tough question because our family suffered a huge loss at this time of year. Our brilliant oldest child lost his life after a very long and challenging illness. It was in a December. Still can’t believe he is gone. So, deep breath, I look for ways to stay busy and involve others. Share some happiness through the joy of making things and try not to buy into the commercialism that can pervade. Light some candles to bring light into the dark days of winter. Make music, sing and dance with your friends. Hold somebody’s hand. Share food. Look at the stars. CP: What are your favorite Christmas cookies? 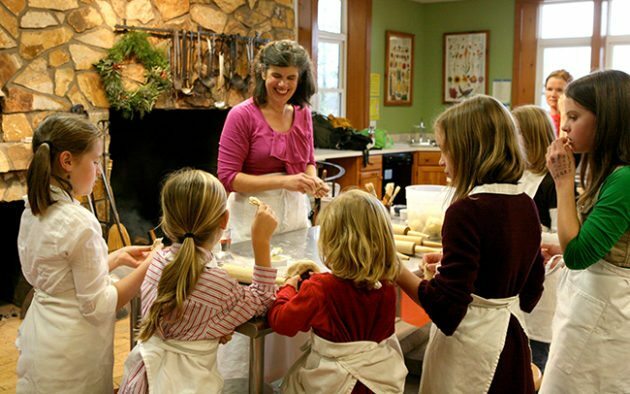 ND: For many years I gathered whatever children of Folk School staff that were available and took them down to the cooking studio to make cookies for the Children’s Christmas Party. Isn’t that great? They made the cookies to share with the fifty or more young children who come for the party. We made jam thumbprints, gingerbread trees, cornflake wreaths, coconut macaroons, and chocolate brownies. I had kids from age four to fourteen working together in the studio. Until she went off to college my daughter, Chloe, helped me with this and some of her friends did too. Several years it was all boys making cookies, some of them really young. They are grown now, but I bet they remember. 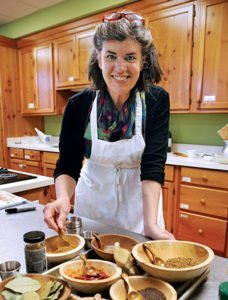 We will include all those recipes in the upcoming Folk School cookbook. That book will be a seasonal celebration through food and photos of these past twenty-five years plus some earlier recipes and memories. CP: What do the holidays mean to you? From New Years to May Day to Fall Festival and thru winter’s holiday season we offer up the opportunity to parade, play an instrument, do a dance, plant a seed, and make something wonderful to share. I believe the emphasis at holidays should be these things, a break from the normal work activities, and a chance to acknowledge the spectacular beauty of our four seasons in western North Carolina. 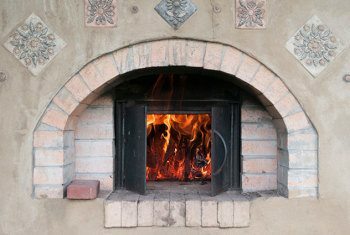 Spend a winter’s week learning the art and science of the wood-fired oven. Learn to manage the fire and bake pizzas, flatbreads, and focaccias. We’ll also roast and grill meats, fruits, and vegetables and create deeply flavored curries, stews, and pots of beans. Everything from appetizers to desserts will be investigated. Get tips for duplicating recipes in your own home oven as well. Some basic cooking knowledge and kitchen stamina is helpful for this class.